One challenge with establishing a natural cultural district in the early stages, especially one that’s retail-oriented, is reaching a critical mass where it feels like a place. One solution is to build a microcosm of a such a flourishing retail center so people can experience the vibe of the larger district, and for that we have Hollywood’s Space 15 Twenty to thank as a model, to a certain degree. Featured in the latest Springwise, the concept is brilliant – Space 15 Twenty is a collection of eight stores centered around a common courtyard, with seven of the stores (including a cafe, pictured above) strategically complementing the one anchor store and an art gallery. Those seven stores rotate out to make way for new stores (though it’s unclear how often) to keep the retail mix fresh, much the same way the work of local artists rotates in the gallery, thus the loft-like interior design costs are kept to a minimum. Local bands are featured via courtyard concerts. 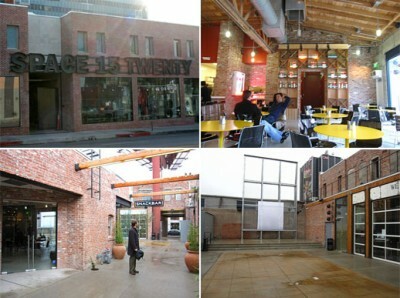 In other words, Space 15 Twenty is a creative gallery, for not only art, but music and retail as well. Ok, so the not so hot aspect of the destination is that the anchor is a national chain (Urban Outfitters), and the complementary stores are chains as well, so there’s really no inherent neighborhood soul or character, and not only do you need national corporate approval for local events, but you even need that same approval to show official photos of events in the space, which at least can be seen on the Space 15 Twenty Flickr corporate account and are definitely work viewing. The point is that I’m sure creatives are waiting for someone to sponsor a local indie version of Space 15 Twenty in their neighborhood, and are ready to crowdsource it if given the opportunity.